How to convince my Chiropractor to check leg length? Is the rib cage level? How to convince my Chiropractor to check leg length? Frankly there's none so blind as those who will not see. I have been to many DCs over the years. When I mention I think I have a short leg, they say my pelvis is off but not a short leg as those are rare. One DC I went to for over a year with little progress on my low back pain, so after stopping there, I put a heel lift in...I was good for about 5 years (only minor stiff necks). I am again seeing a different DC and she too says a short leg is rare and a lift could have been doing more damage. I asked to have my legs checked and she never xrayed for it (back shots were above femur heads), she just checks them on the table. I have been going for a few months and I still have lower back pain when standing, while my upper back keeps slipping out, sometimes before I leave the office. Standing with a construction level at the top of my tibias, one is about 3/8" higher. Laying on my back with knees at 90 degrees, the same one is higher. What xrays or tests are most accurate to convince her and me, whether I actually have a short leg or not? I don't want to keep going so often if a heel lift would shorten the treatment. It's a very good question your raise, and it would seem controversial. There are two kinds of short leg. 1. An anatomical short leg. One leg simply grew faster than the other, or perhaps there was a fracture or a fallen arch. It's not uncommon at all, in fact I'd suggest it's the norm, just most are only a millimetre or two and not clinically significant. 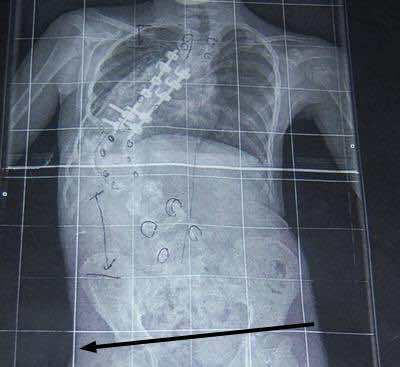 I don't think it takes much imagination to see that a short leg was in part the cause of the scoliosis above. Also there is quite strong research showing that a short leg, again for obvious reasons results in more arthritis, wear and tear, in the spine, hips and knees. But not if it's only a mm or two. 2. Then there's a functional short leg. This is the kind that we chiropractors are checking for whilst you are lying on your tum; it's caused by a subluxation in the pelvis, and is very correctable with the right kind of thrust. Keeping it correct involves inter alia a set of pelvic exercises done daily before getting out of bed, otherwise you keep needing to see your DC. And of course, most often they occur together; the art of chiropractic is to know what is anatomical, and should be managed with an insert usually inside and occasionally under the shoe; and what is functional and needs adjusting. I'm disturbed the chiropractors you've seen over the years don't seem to appreciate what for me is basic chiropractic. It's not rocket science. Ask hubby to stand behind you, feet together, easiest seen with no clothing on the upper body, and slowly bend forwards. Is there an obvious list to port or starboard? Minor anatomical short legs will cause tiny deviations; that's not what we are talking about. Is the rib cage level? Now, ask him to place his hands on the iliac crests, top of the pelvis and simply eyeball whether his hands are level. If there is a markedly anatomical short leg, it's immediately visible, even to the lay person. Perhaps if you were standing in front of a mirror, you could see it too. More difficult is what to do about it. How thick should the lift be, and should it go under the heel or the whole foot. I use a test that I can't really explain. It's called a proprioception test. Orthotists have some fancy devices that will measure it too. An x-ray of the pelvis, taken standing and centred on the tops of the femurs will give a pretty good measure of how short the leg is, should hubby's test be significant. I suppose you could print a copy of this and it might help how to convince my Chiropractor to check leg length? Probably not, as most of us are know it alls and won't easily change an opinion held for many years; more likely put his back up and his pelvis out! One last thing; I'm not convinced that expensive orthotics are the solution, but perhaps they are. That you have to work with. For me, a simple inexpensive lift in the shoe is very effective. Good luck, you've opened a can of worms! Comments for How to convince my Chiropractor to check leg length? I HAVE BEEN BATTLING PELVIS AND LEG PAIN FOR 4 MONTHS AND CONTINUE TO GET WORSE. I FINALLY WENT TO THE VA LAST WEEK BUT THEY JUST SCHEDULED ME AN APPOINTMENT FOR MAR 11TH. I'M WOULD LIKE X-RAYS BUT, WHILE WAITING I RAN ACROSS A POSTING FROM A LADY WHO HAS SI AND PELVIS ALIGNMENT PROBLEMS AND AFTER A LIFETIME OF INJURIES AND ACCIDENTS I DECIDED TO READ INTERNET POSTINGS AND STUDY DIAGRAMS AND SELF-TESTS AND I THINK MY LEFT PELVIS IS WAY OUT OF WAC. IT SITS BACK COMPARED TO THE RIGHT ONE AND MY KNEES ARE NOT EVEN WHEN LAYING ON A FLAT FLOOR AND BENT 90 DEGREES. AND WHEN I TRY THE STRETCHES THAT FORCE THINGS TO LINE BACK UP, IT FELT GOOD. WHEN I READ YOUR POSTING I WAS PARTICULARLY GLAD/GRATEFUL THAT YOU LET EVERYONE KNOW THAT MISALIGNMENT IS MORE THE NORM THAN THE EXCEPTION. I DIDN'T REALLY CONSIDER THESE PROLBEMS UNTIL POSTINGS LIKE YOURS LED ME TO REALIZE HOW MUCH I FAVOR MY RIGHT SIDE AND HOW MUCH UNEVEN WEAR AND TEAR I HAVE INFLICTED OVER THE YEARS. THANK YOU. Pleasure Glenn. Exercise your back and pelvis gently every day before getting out of bed and you'll be amazed at the difference; I do it myself. Correcting a leg length inequality though is more difficult.